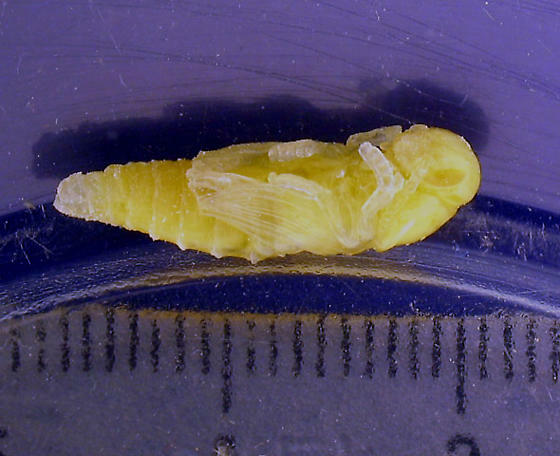 Collected December 25, 2005, one of three grubs found inside a dry sotol flower stalk in New Mexico and brought home to New Hampshire has survived its diet of rolled oats and puppy chow and has pupated. (The other two died.) If it survives awhile longer, we should have an adult to identify. This would then be my first buprestid to mature in captivity, assuming it's what we think it is. This pupa, like the larva for several weeks prior, seems immobile, quite unlike most larvae and pupae I have encountered. I was worried that it had died like the others and was waiting for rot to set in just to be sure. I'm glad I waited!